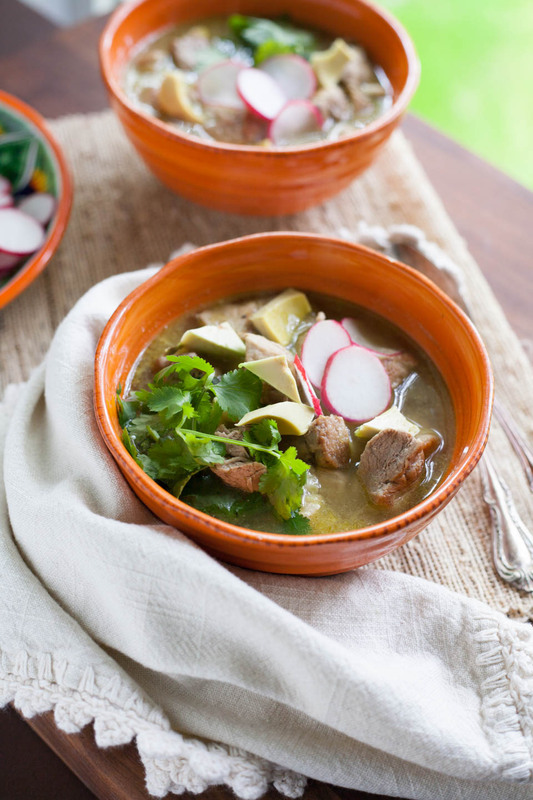 Pozole Verde is a total classic stew soup served for brunch or late night meals. 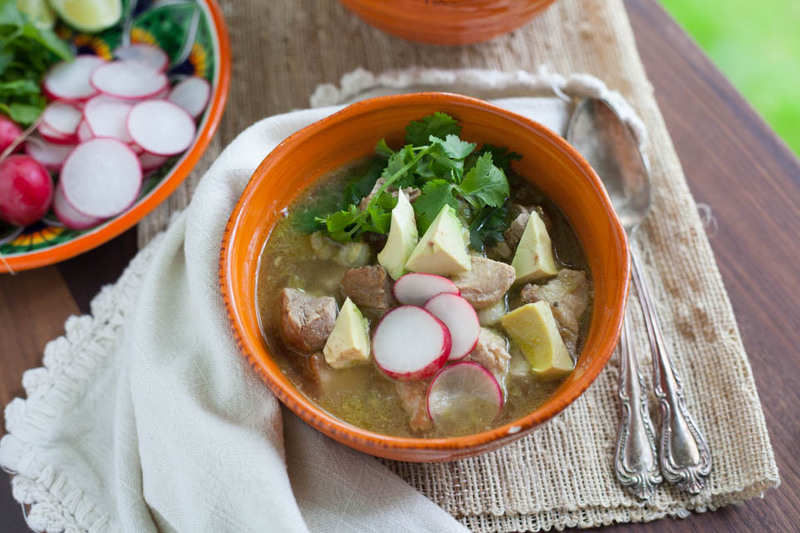 Red pozole or pozole rojo is mostly what I grew up eating but I’ve always loved a good pozole verde. It’s like a good chile verde but with hominy, which I also love so much. 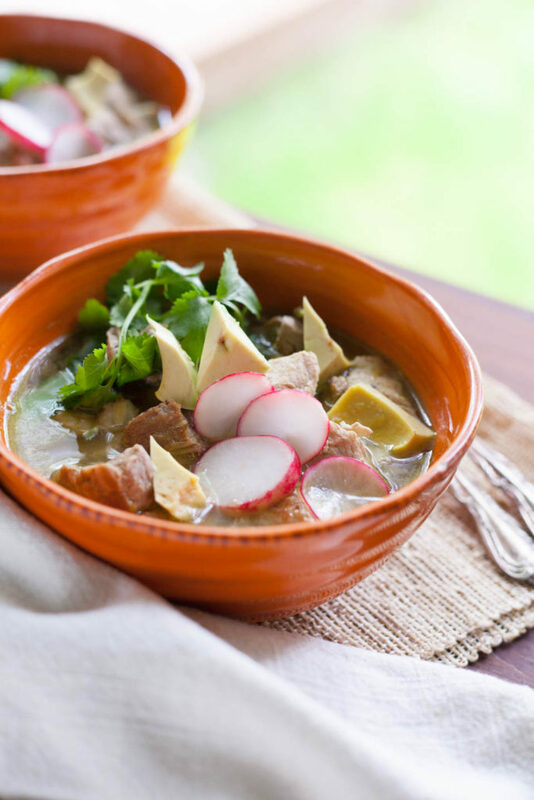 This soup is served with so much fresh goodies that’s almost what I like most about the recipe. It’s served with fresh lime, finely shredded cabbage or lettuce, raw white onions that slightly cook when you add it to the hot broth, fresh cilantro and tortillas to make the best little tacos on that planet. Oh yes, that’s the other part I love about Mexican dishes, you make little tacos with what’s on your plate or in the bowl. Similar to a baguette and spaghetti, marriage made in heaven of food! You can easily make this with chicken if you prefer it over pork. Use a thigh or dark meat preferably. Breast meat will dry out in cooking. This can be made a day ahead, soups like this are always better the next day! 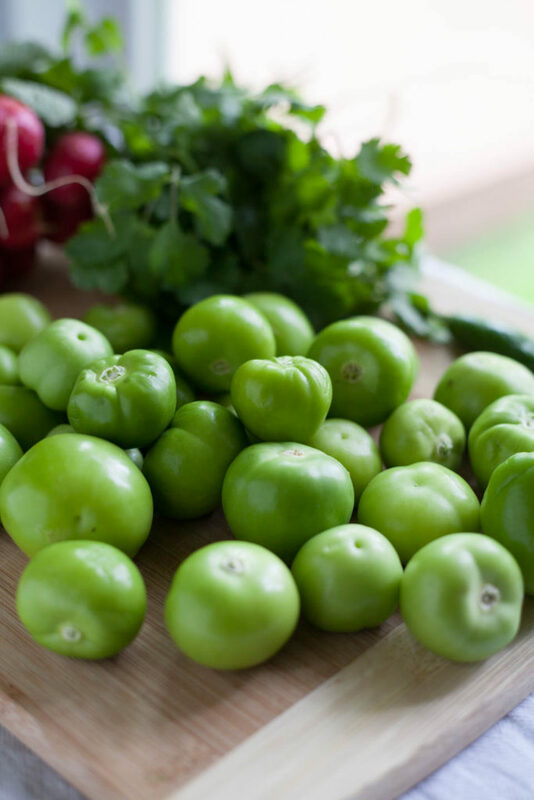 When choosing tomatillos, pick the smaller ones, they have more flavor. For serving: Finely shredded iceberg lettuce or green cabbage, thinly sliced radishes, chopped white onion, diced avocado, corn or flour tortillas, and lime wedges. In a large dutch oven or stockpot, add olive oil over medium high heat. Once shimmering, in small batches, brown pieces of pork. Once all pork is browned, add stock, bring to a boil, reduce to a simmer. While pork and broth are being brought to a boil, blend tomatillos, onion, poblano, serrano, garlic, cilantro, and oregano in a bender on high speed until smooth. Add to broth, stir to combine. Add 2 teaspoons salt and 1 teaspoon pepper, stir. Cover and cook for 1 hour on medium low heat, simmering, not boiling. Taste for seasoning, add salt and pepper if needed. Uncover and cook for 15 minutes. Serve immediately with finely shredded iceberg lettuce or green cabbage, thinly sliced radishes, chopped white onion, diced avocado, corn or flour tortillas, cilantro, and lime wedges. Store leftovers in an airtight container for up to 5 days.